While the West Linn baseball team fell short of its ultimate goal at the Firecracker Classic, the Lions did a lot of good things along the way. West Linn went 3-2 in the four-day tournament at Lakeridge High School, won its four-team pool and won again in the tournament semifinals before finally falling 5-4 to Perth, Australia, in the tournament championship. Just as important, West Linn continued the process of building its lineup, assimilating new players to the varsity level and helping returners adjust to new, bigger roles. "I feel like the freshman are definitely coming along," said West Linn outfielder Gabe Johnson, who will be a senior in the fall. "They still need to learn some stuff, but there's definitely a lot of talent and potential with these new upcoming players." "Just the experience for the younger guys, I think, is really important," said catcher Garrett Wiancko, another incoming senior. "And for the non-baseball aspect, just getting to know these guys, it's been a lot of fun. I'm having a great time with it." The Lions opened the tournament with a 9-1 win over Jesuit on June 28, shut out Mountainside 4-0 on Friday, dropped an 8-5 decision to Columbia River — but still took first place in their pool — on Friday, then beat Lakeridge 4-1 in Sunday's semifinals. West Linn 4, Lakeridge 1: In the tournament semifinals, the Lions started quickly with three runs in the top of the first and using that fast start to beat the Pacers 4-1. J.K. Kelly opened the game with a leadoff homer to center field off Lakeridge starter Tyler Sloan, and the Lions tacked on two more runs after that. Wiancko and Johnson followed with singles, and both scored on Parker Stevenson's double to center for that 3-0 lead. The Lions' last run came in the seventh when Clay Masters led off with a single, stole second base and later scored on Caden Parker's sacrifice fly. Pitcher Kyle Sullivan threw a complete game, allowing one unearned run on five hits and no walks while striking out six. 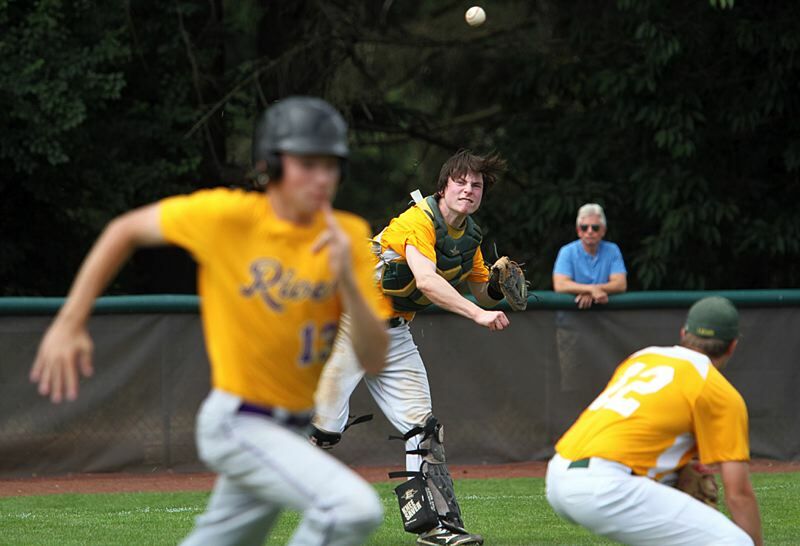 Columbia River 8, West Linn 5: While the Lions fell short in their final pool play game, they did what they needed to do, tying Columbia River and Jesuit in pool play at 2-1 but winning a semifinal berth based on run differential. The Lions led 1-0 on another game-opening homer by Kelly and tied the game at 2-2 on Johnson's RBI double in the top of the third, but saw Columbia River take control with five runs in its half of the third. The big hits there for Columbia River were RBI singles by Dylan Buhrmester and Garrett Figgins, and a squeeze bunt by Derek Mettler. West Linn scored twice in the fourth and once in the fifth to close within 7-5, but got no closer. In the fourth, the Lions got a two-run triple down the right field line by Wiancko, while Johnson doubled and scored on Stevenson's sacrifice fly in the fifth. For the game, Wiancko went 3 for 4, knocked in two and scored two, and Johnson doubled twice, went 2 for 4 and scored once. West Linn 4, Mountainside 0: Johnson controlled Mountainside from start to finish in their Friday game, holding the Mustangs to three hits and four walks while striking out eight and allowing just one runner as far as third base. West Linn scored all four of its runs in the fifth inning, with the big blows there an RBI single from Masters and a run-scoring double to center by Kelly. Stevenson and Zach Bell also had hits in the inning. West Linn 9, Jesuit 1: In its tournament opener, West Linn scored twice in the second inning, saw Jesuit close within 2-1 in the third, then dropped the hammer on the Crusaders with six runs in the bottom of the fourth. In the second, Caleb Franzen and Parker both drew walks, and both scored on Kelly's double to left field. Jesuit's lone run came on an RBI double by Kellar McCarthy in the top of the third. The Lions then broke the game open with their six-run fourth, getting a run-scoring double from Parker, RBI singles by Kelly and Chase Bartley, and a two-run double to center by Stevenson. West Linn's final run came on Wiancko's bases-loaded walk in the fifth. For the game, Kelly went 3 for 3 with three RBIs and one run, while Bell allowed just five hits, three walks and one hit batter while striking out eight.